There are many things one need to consider before signing the cheque for the graduate school and these factors play a very important role. You need to ask this question to yourself before making a final decision. Once the decision made, the fee paid then there is no turning back. So you need to evaluate each and every factor because education nowadays come with very high price and the cost you have to pay with the money came from your hard work. In this article, we are going to discuss “Is Grad School worth it?” and the main topic related to it. We aim to help you in the best possible way and we hope this article helps you in making this important decision. Is Graduate School Worth the Time and Money? This is the question most youngsters want an answer of and it affects lot of young minds as well. Graduation school comes with a very high price and they affect your growth because this is the money you are going to pay from your first salary. The decision of attending graduate school may look appealing to many because of the high pay package, many courses offer after graduation and the early promotion due to the time you spend in school, but is it worth the burden of money you are going to take on your head, if you go to graduate school? Money plays the important role, but you cannot ignore the fact that the importance of graduate school in your career. There is a path you can choose and excel without attending the graduate school and on the other hand, there is career path which needs a graduation degree to excel in your workplace. It is all up to you and what you choose as your career path. 1. Do I need to attend? This is the very first question you need to ask yourself. You must know why you are attending and whether there is need of attending or not. 2. How much it’s going to cost? Education nowadays come with a hefty price which you are going to pay if you decide to attend the grad school. You must do the necessary check of money and how much it’s going to cost you if you decide to attend grad school. 3. Am I able to pay after grad school? 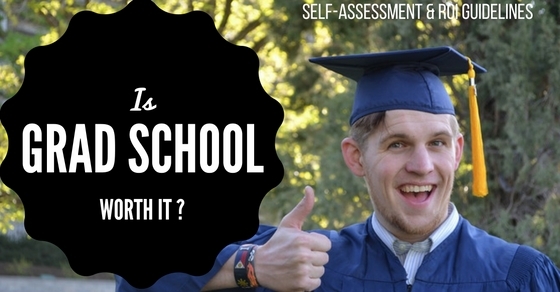 This is a very important question to ask yourself before you decide to attend grad school. The money factor outdid every other detail and you need to know beforehand that, are you able to pay your grad school fee loan within the year of a job with enough money to survive. Time is another factor you need to keep in mind while deciding on grad school. The time you spend in grad school and the time you spend paying your loan back are both very important. If your grad school is 3 years and then you spend another two paying fee loan and after spending 5 important years of your life, if you are standing in the same spot then the idea of attending grad school is a total fail. Understand the real time play and consider it when you take the decision. 5. My career after attending graduate school? Grad school is not some magic wand, which turns you into a millionaire after completing your graduation. You need to be practical while making such decision. Try to visualize yourself after attending grad school and include the entire important factor, if you see your successful career then go for it and if you have uncertainty then start working on your plan of attending grad school once again. There is another method of calculating ‘is grad school worth it or not’. ROI means return on investment and it is a popular method of checking whether you should attend grad school or not, because it provides a better picture of the investment you going to do if you go to attend the grad school and the return on the investment you made. This is the way which tells you if you are taking the right step or digging a hole for yourself. Calculating ROI gives you a clearer picture of what you are getting yourself into if you decide to attend grad school. There are seven steps to calculate the ROI. The cost of grad school is an important factor in calculating ROI because everything depends on the cost of grad school and the fee is the basis factor for which we are calculating the ROI. Many students have the opportunity to complete their grad school without paying it directly instead they sign to work for more years after grad school and their existing workplace paid the fee for grad school. Some student gets teaching assistantship and other get research assistantship. So, you need to calculate the cost and job prospect so that you can weigh them to know which part is more reasonable and profitable. Your first-year salary shows how successful are your idea of attending grad school. To calculate the ROI you need to calculate your first-year salary after completing grad school. We know you cannot draw the exact figure, but you can calculate an estimated salary by keeping few factors in mind like your GPA, market conditions and the popularity of the course you are going to take. The cost of the course, estimated first-year salary will give you a clearer picture of what you are getting yourself into. Now you have your estimated cost of the grad school fee and your first-year salary after grad which is a very important factor in calculating ROI. The next thing you need to do is do the sum of money you spent on your undergrad school and the estimated cost of grad school and this will give you a rough estimate of the cost you spent on learning and education. Now minus your first-year-salary-after-grad-school from the total sum of your estimated cost of education, if the cost of your debt is higher than your first-year income then you need to reconsider your grad school program because your education cost way higher than you can afford. You can choose another source of income or choose a different grad program so that you can manage your education debt. If your debt is lesser than first-year-salary after grad school then it means you have taken the right decision of going to grad school but this is not the end of calculating the ROI. We still need to know the end result if it is safe investment or not. Now you need to calculate your long term income say 10 years with grad school and without grad school. When you calculate with grad school you add debt and the payment in your income which affect the end result of a 10-year income, similarly if you calculate without grad school it increase your income to some level. The whole point of calculating the income of 10 years is to know how successful the plan of attending grad school is when it comes to long-term incomes and savings. If the cost between income with grad school and income without grad school fluctuates too much then maybe you should reconsider your plan and need to use different tactics. Yes, another factor you should consider while calculating the ROI of the grad school investment. Your retirement plans are very important because this is your future and lots of things depend over it. Consider your retirement plans and the impact of your grad school over it because attending grad school can go in both directions. You can get better jobs and pay which overrides the two years non-working period or your job may set you back two years because now you have less experience than anyone else. Actually, the whole purpose of calculating the ROI is to know how successful is your plan of attending grad school and how it’s going to affect your life in the long run as well as have a direct impact. Yes, you need to be practical while calculating the ROI because there is nothing certain when it comes in the future, no one knows how it’s going to turn out and you are just estimated on the basis of some figure which has chances that it may go wrong. Keep that in mind that there are other factors which affect your ROI in a different manner and situations are not always in your favor. So be prepared for either outcome, you can excel by calculating and following the well-structured plan and you may fail if something goes wrong way on the plan. The reality of the situation is always different from our calculated move simply because you cannot calculate those things which come without a price or as priceless. There are few intangible factors you need to consider in like the knowledge you gain after attending grad school and the benefit of knowledge when you go for the job. There are also many things which are not coming under financial calculation and as we say the future is totally uncertain. The fact is calculating the ROI is like taking the risk by weighing pros and cons where you do not have any certain picture. There are many factors which affect the ROI directly and indirectly, and you cannot calculate every small fragment. At the end, it’s just the numbers. The graduate school has its own pros and cons depend on your need, for some it improves their skills and help in earning more while on another it has less to negligible effect. It just depends on your need and the career path you choose. To know is grad school worth, you need to evaluate your need and the impact of the grad school if you attend it. There are courses like medical, engineering and teaching where grad school works like magic in increasing their income as well as the growth of their career. So, grad school is worth if it meets your career goal, help you in the growth of your career, improve your financial status and you need it for promotions and increments. The best graduate degrees for the jobs in 2016 are science, technology, engineering and maths because they promise good pay package and instrument as well as a good amount of knowledge. The more the knowledge, betters the quality of work and less stress. The worst graduate digresses for jobs in 2016 are in various areas of education because of the investment and low return.